As costumed ghosts and ghouls start roaming the streets this Halloween, and our fun festivities begin, it is important to keep our animals out of danger. While it seems like a great idea to give the dog some exercise while Trick or Treating, most pets should be left at home. Many dogs are nervous with unfamiliar people, especially good-intentioned children trying to pet them. Dogs will often exhibit behaviours trying to tell others that they are uncomfortable: ears flattening against the head, tail tucked between the legs, backing up or trying to run away. Children often don’t know how to interpret these signs of anxiety, and this has resulted in millions of dog bites yearly. In most of these situations the dog was trying to protect themselves from the perceived threat, and had been politely telling the child that he/she was not comfortable through body language. When the body language was not helping the dog share their thoughts, the bite was the next step, however inappropriate. Educating your children to avoid petting dogs that they do not know, and teaching them signs of what a nervous dog may look like can help to avoid some potential dog bites. 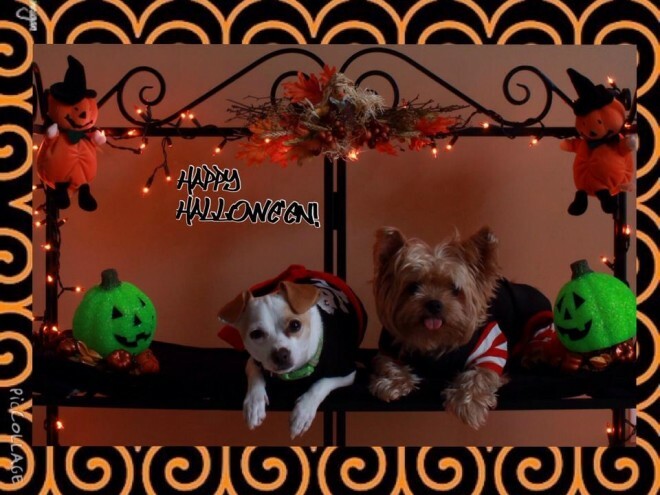 Cars, Trucks, and costumes can be scary to our dogs, some may run away from the offending noises, others may run toward vehicles to attack them. Unfamiliar noises can cause dogs and cats to bolt. Either of these responses can be dangerous for the dog/cat. Other dogs outside also can pose a hazard, this week alone we had two dogs come in with dog bite wounds. Keeping your dogs at home is the safest place for them. For ease of walking, the most recommended leashes would be either a Gentle Leader head collar, or a non-retractable short leash or harness. Retractable leashes can be dangerous in a few scenarios, it is difficult to control your dog when another dog approaches, or when a car is backing out of a driveway, just as a few examples. We all know that chocolate can be toxic to our pets, causing issues such as liver failure. Other items in kids’ candy pails can also be toxic, such as candies which contain xylitol (an artificial sweetener). Please ensure treats are tucked away and out of reach of our furry children. Many patients have developed bloating, vomiting or diarrhea by stealing a snack, and then the kids are missing out on their hard earned candy, too! For the talented seamstresses: needles, thread, and wool can be tempting for cats to munch on. Keep these items tucked away when finished with them, and keep the pets out of the area while using them. Dogs may find a costume piece an irresistible treat. Be cautious with any small parts which may be swallowed. Give your pets some great attention this Halloween, but keep them safe and spare the candy. Trick or Treat! Thanks so much for reading! And commenting!